Recently, my hometown Atlanta Braves won a 19 inning game against the Pittsburgh Pirates on maybe one of the worst calls in major league baseball history. Even though I don't follow baseball like I used to, I'm still happy to see the Braves win; just not like this. I also know that when a blown call happens to one of my teams, the reaction is not pretty. 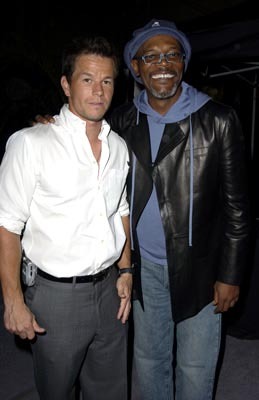 I have probably burst more blood vessels and yelled at more television sets in a tone that is normally reserved for movie roles staring Mark Wahlburg or Samuel L. Jackson. But when they get together, it is eerily calm. One day, I finally realized how displaced my anger often was at officials. That day was when one of my favorite officials (yes, you can have favorite officials), Ed Hochuli, completely blew a call that cost the San Diego Chargers a game. But here was the catch: He immediately admitted his mistake and apologized. He even responded to Charger fans' hate mail because "people deserve a response." Umpire Jim Joyce ruined a perfect game by pitcher Armando Galarraga on terrible call. He then personally apologized to the pitcher while nearly breaking down in tears. These guys apologized and owned up to errors that were made in front of millions of people. What else can we ask for from a person that messed up and feels badly about it? THIS...ALL OF THIS THAT IS INSIDE OF YOU! 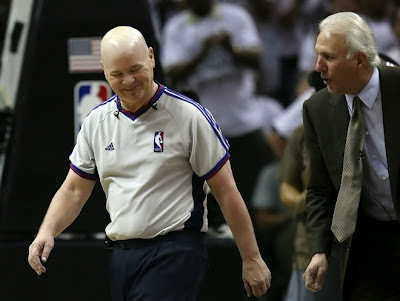 ...which brings us to one Joey Crawfod, veteran NBA official. 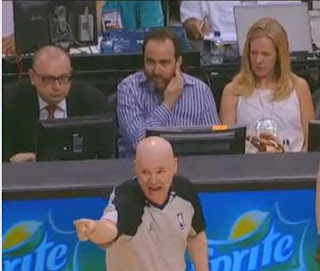 You won't find many NBA fans that don't shudder and/or laugh about what an awful referee he is. Joey Crawford runs down the court, slams into Dwayne Wade (knocking him to the ground), and calls a foul on Wayne's defender, Chauncey Billups. Here is another classic where Crawford decides that Marcus Camby fouled Steve Nash from 10 feet away...WITH HIS MIND! 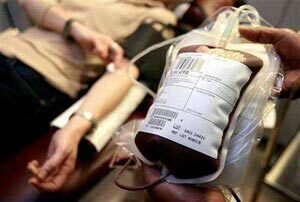 But both of these examples pale in comparison to what happened on April 15, 2007 in a game between the Dallas Mavericks and the San Antonio Spurs. Tim Duncan, who was the Spurs best player, had received a technical foul for arguing/commenting towards Crawford...while sitting on the bench. On the next play, Crawford calls a very questionable blocking foul against the Spurs. Duncan begins laughing, covers his face with a towel...and Crawford gives him another technical foul, ejecting him from the game. The replay shows that Duncan didn't say anything to Crawford (or anyone else) that warranted the second technical. He just sat on the bench and laughed about a bad call. Furthermore, Duncan (who is well known for his low key personality and high moral character) claimed that Crawford repeatedly challenged him to fight during the game. You wanna go, mama's boy?! For once, NBA commissioner David Stern did something that I agreed with and suspended Crawford for the rest of the 2007 season and playoffs. Tim Duncan was also fined $25,000 because hey, why not? 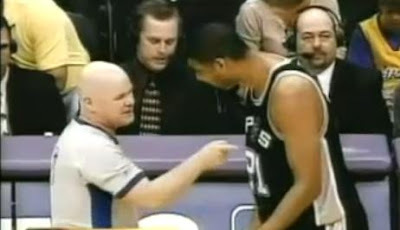 After talking with the NBA vice president of basketball operations, Crawford apologized to Tim Duncan, the Spurs, and the NBA for his unexceptable behavior...HA! Just kidding; he actually said that given the chance he would do it again (Crawford's ranting highlighted). And I would've kicked out that guy for looking at me funny! He went on to say that if the NBA did not like the way he handled the situation, then he had a problem with his employer. The NBA responded in turn...by reinstating him for the 2008 season. It looks like Crawford may be up to his old tricks again, but at this point, no one takes NBA officiating seriously anyway. It often times works much better as comedy. I will leave you know with a funny example involving Crawford and two players that I can't stand: JJ Reddick and Dewayne Wade. Together, they make the greatest modern incarnation of Larry, Moe, and Curly that you will ever see. 1. During a fast break, Crawford gets knocked to the floor by Reddick. 2. Reddick shoots a jump shot. 3. Dewayne Wade leaps into the air and misses everything. 4. Reddick pretends to get hit and flings himself onto the floor. 5. Crawford rolls around the ground, blows his whistle, and calls a foul on Wade. 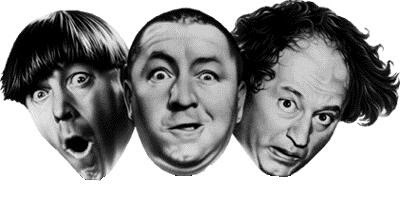 The Three Stooges, everyone! Thank you, and good night! hahaha that guy aint a serious ref, he is a crook with uniform. hilarious though, but embarassing at the same time. Definitely. I'm also a VERY casual soccer fan (I really only get into it for the World Cups), but I'm thinking about doing an entry on horrible ref Koman Coulibaly. Hmmm i guess you could write a piece on Tom Henning. A Norwegian ref that has been frowned upon a few times. If you happen to write about soccer, i will glady feature you in my blog and publish it there too along with a permanent link if you want to. Or if you want to write ANYTHING soccer related, let me know, i will glady publish it in my blog in my new section for guest writers :) Check my blog, you can find all the info there.